Your faith in God must have a strong foundation. God outlines some key principles in the Bible that are essential for growth and maturity in your new life in Christ (Hebrews 6:1-2). To help build your new life around these key principles, RISK Church has created two self-study booklets (see below) and a companion guide. Work through them prayerfully and you'll ensure that you grow strong and mature in your relationship with Christ. Don't rely on Sunday sermons to cover these principles. Sermons only touch on them occasionally because everyone is at different stages in their walk with Christ. This guide contains nine short studies to help you understand what it means to be a ‘Christian’. You'll explore the Bible and the key foundational principles for growing into a mature, joyful and functioning Christian. Ask your Life Group leader for a copy today! Although designed as self-study, you'll get the most benefit by going through these studies with someone to review them and to discuss any questions you have. Even if you're living out these principles, we suggest you work through this booklet at least once. It's amazing what the Holy Spirit will reveal to you at a deeper level. It'll also help you appreciate what the younger believers in our RISK family are focusing on (you'll need to work through the booklet if you want to be involved with discipling). Once you've completed the Faith Foundation studies move on to this series of seven essential in-depth Framework studies. This series is called the “Framework” because the Bible describes us as "being built together" as a house, a temple, a dwelling place for God. The studies will help you build sturdy house framing, so to speak, for your relationship with Christ - getting the structure right is necessary for helping everything else in your life in Christ fit nicely into place! We are called to make disciples as well as be disciples. In fact, we grow in our faith by helping others grow in their faith too. This Companion Guide to the Faith Foundation Booklet will help you grow others . Talk with your Life Group leader about attending a training. This guide will help you understand what we sense the Lord wants to achieve in the lives of new believers through the Faith Foundation booklet. It outlines what is expected for discipling a new believer at RISK. 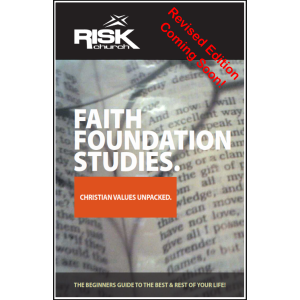 It also contains lots of tips for turning each Faith Foundation study into an encounter with God! You will be paired up with a new believer (when available) once you have attended a training session to take you through this Companion Guide. Prerequisite: You need to go through the Faith Foundation studies for yourself first.